My friend Sabrina brought us some NYE paraphernalia and this hat- Bad Hair Day. The ball dropped—Mauricio and I watched it in my tiny room. In the background the beat of the IV machine signaled over and over that it was time to do something. Maybe move from the antibiotics drip to a blood transfusion. It wasn’t the way I had imagined welcoming the New Year, in a neutropenic room in the hospital. I thought back to the previous year’s Dec 31st, a date that I remember what I was up to without looking at the calendar. Last year we were in Mexico- my daughters dressed in my favorite matching dresses, an anomaly for them and something that inexplicably made me feel like all was right in the world. Mauricio and I toasted new beginnings with a rum and coke as fireworks lit up the Pacific a safe distance from us. Will I ever feel that light and carefree again? Probably not. 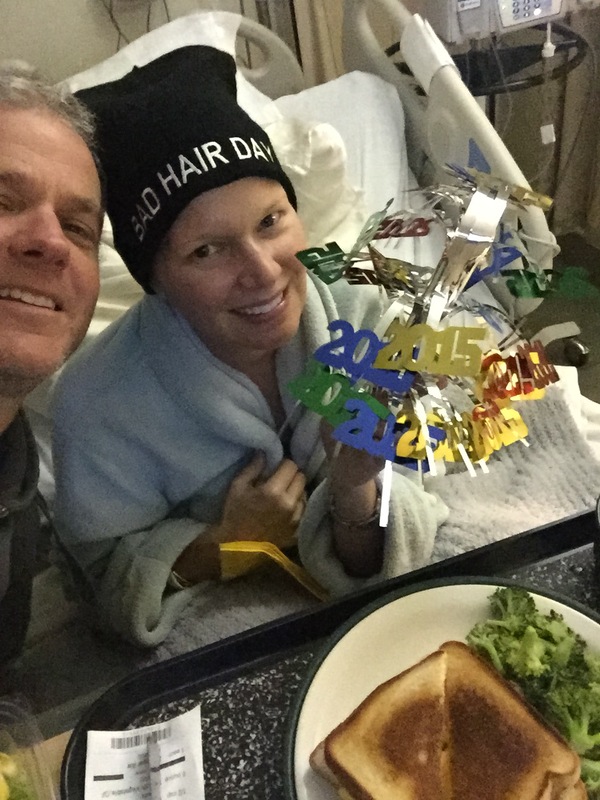 Or worse– and I’m afraid this is an unwelcome sack of thoughts that escorts cancer wherever it goes– I wonder how many more New Years I’ll see. Sorry- dark thoughts creep in and punch me. Unproductive, though. 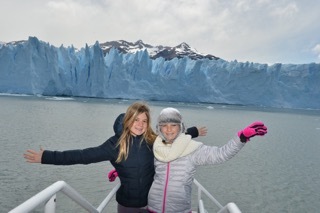 This year, my kids were almost 7,000 miles south of us- in picturesque Patagonia. Missing them was morphing from a cerebral thought to something physical, as if my fever might cool down if I could just touch their smooth skin and gaze at their sparking eyes. But I was thankful—relieved, even, that they were not around to witness their mother spend 5 days in the hospital with neutropenic fever—after my first of four AC’s (Phase B of my overall chemo treatment). My darlings- at the tip of the world. No one sails through chemo without side effects. Be it vomiting, loss of feeling in the limbs or other startling byproducts. Mine is extreme bone marrow sensitivity and all that comes along with that. My blood cell count levels keep plummeting to zero after each session. The AC is hitting me worse than Phase A—maybe it’s “the red devil” (as AC is called) or it’s the cumulative effect of 18 chemos. Not only do I reach rock bottom—now it’s starting to take painfully long to recover. Each morning the doctor enters my hospital room dressed in astronaut-like attire so no germs reach my airspace. My immunity is so low I’d catch anything. He comes to discuss my white and red blood counts and I love that I’m told what’s going on. They focus a lot on ANC (Absolute Neutrophil Count) which is basically baby white blood cell count. It makes sense since this is the number of new white cells growing up to create the immune system, gallantly fighting off any bacterial or viral intruder. To give you a baseline: normal levels are between 1.8 and 6.8. Mine was at an embarrassing 0.01 when I was admitted, then putzzed to 0.02 the next day. They won’t let me leave until I’m at .1. It’s day three and it’s only at .05. “Really?” I say, wondering what’s their problem. “I’m disappointed in them.” I tell the doctor as if I’m a teacher talking about errant students. As if chemo or any of this followed reasonable negotiable lines that logic could work with. 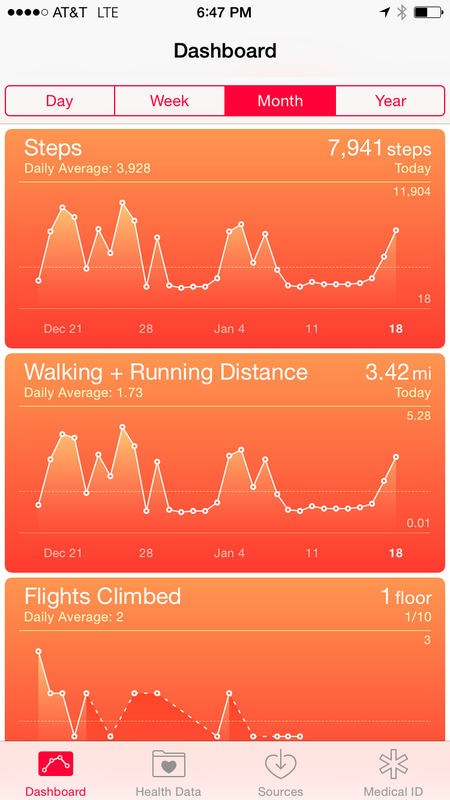 The health app on my phone visually represents the ups and downs of chemo. Some days I’m able to go for a walk but at the low-points I don’t leave my bed. While essential, staying in the hospital is prison-like and I notice how my brain begins to focus on the minutiae. Mauricio arrives in the morning, usually right after they’ve drawn blood. We chat and in a couple hours, I’ll tape the tubes running into my port under a huge plastic bandage and roll the IV stand with me into the shower. Then I’ll eat something. More IVs. Then we’ll read- I’d like to finish The Circle and I have an enviable stack of books sitting on the desk behind me. In a few hours it’ll be dark and I’ve barely moved. It’s fine, I justify- I get pretty worn out after three minutes on my feet anyway. I might as well settle in and listen to another episode of “Serial”. In between transfusions, I’ll order dinner and we might watch a movie. Before Mauricio leaves, I’ll pierce a Neuprogen shot in my belly and take medicine to ward off the accompanying bone pain. I’ll swoosh some Magic Mouthwash to numb away the pain of mouth sores so I can bear brushing my teeth. Then I’ll wait till my final IV at 11pm before I’ll pop an Ambien so I can sleep. If I don’t, I’ll google triple negative breast cancer and freak myself out until all hours of the night. Yup, sleeping is better. In the morning, Mauricio will be back smiling, his face slightly frozen still from swimming early in the SF bay. He is a godsend—never ONCE in 5 months has he made me feel like I’m a burden. I’ve thought about this to great length and still find it amazing. I’m thrilled he’s swimming on a daily basis because it restores him and to some odd degree, I feel like I’m there with him. Maybe that’s why he’s in first place for the Polar Bear Challenge at the Dolphin Club– poor guy needs to swim for two. My blood levels mosey upwards and a couple of days later the nurse opens the door and says the counts are good enough to go home. I close my eyes with relief. “Should I expect the same thing for the next three ACs?” I asked. “It’s not going to get any easier,” she replied, “but it’s not that bad here, right?” It’s true, I think. It isn’t that bad. I just wish for some undeniable proof, something etched into cement to quiet my brain and reassure me all these ups and downs are working. Fast forward a couple of days, past my second AC chemo and sure enough I hit another depth. I’m basically an unmovable fixture in my bed and I can feel feverish chills running up and down my spine. Mauricio insisted we go back to the hospital again, ignoring my feeble protests. I whimpered all the way there saying a couple of times aloud: “I can’t do this anymore.” Not surprisingly, my blood cell counts were at another nadir. I’m quickly masked and ushered to the neutropenic ward where I get a boost of IVs and shots to help bolster the situation. This time, thankfully, I got to spend the next seven days at home in my own glorious bed—the doctor gave me an antibiotic to ward away all germs. Two more chemos to go. I’ll be so happy when this part is over (not that I’m looking forward to surgery– but you know what I mean). And I get a feeling that while I’ll never feel as carefree as I felt before my life fractured, knowing how precious life is might make all New Year’s Eves and less significant moments more sacred and special than before. Susan, gracias por compartir. Efectivamente, ante situaciones como la que vives, uno se da cuenta lo frágil que es la vida. Me alegra saber que Mauricio está nadando por los dos. Pronto te daré una sorpresa. Susan thanks for sharing. It´s good to see you writing. First you are great in helping us understand what you go through. Then, it shows you are active, which gives me a sense that you are in relative better shape. You are very close to the finish line for Chemos.. and that has to be great when you are done with them. Your girls are so pretty… and what a beautiful place! You have to go back with them when you get out of this. You are so lucky to have Mauricio there with you. Not only because having a “hot” husband who is a super athlete can´t hurt anyone…. but he is indeed a super person through and through. I am so happy that you guys are there together. Big hugs and kisses from Barcelona. Sooz- you have gotten so far! Almost there. I am willing your white blood cells to “behave” as you cleverly put it. Big big kiss!!! There are no words. All my love to you Susan!!! All that you have shared reminds of your amazing beauty inside and out. I am thinking of you daily. You can do it Sooz!! Almost past this stage- I am willing those white blood cells to “behave” as you cleverly put it. Susan, Wei and I are sending you our love and best wishes as you go through this difficult challenge. The good news is that your are an extraordinary human being and we know that you are going to emerge triumphant and head off to enjoy your next great adventure in the not too distant future. Be well, stay strong, let us know if we can do anything, and we hope to see you soon! Pensamos en ti todos los días . Cuenta con nosotros para lo que necesites . A few weeks ago I developed chest pain. Meanwhile a friend of mine and avid biker died from a massive heart attack at age 53. I also had at that time a 47 year old athlete patient with a massive heart attack in the ICU. My fear of heart disease quickly evolved into full paranoia. I talked with my cardiologist friends and a nuclear stress test was recommended. Interestingly when getting closer to the stress test date my chest pain grew and persisted to a 8/10. I started thinking about all the consequences of having heart disease at an early age. Fortunately the cardiac stress test came back as normal. 30 minutes later my “chest pain” went from an 8 to a 1/10 and then disappeared. You have no idea how happy I was when I discovered it was all OK. If I now place myself in your shoes I can’t even imagine what you are going through. You are getting the best treatment in the world. My dear, my dear…you are truly amazing, Susan and thank you for sharing your story, your courage, your grit, your pain, your hopes and most of all, your love. Please know I send mine to you ever so gently every morning in my meditation. And I hope to see you in San Francisco when I am there with Maja in February. Also, kudos beyond measure to that man of yours–to your love together and to your beautiful daughters who so need it and return it ten-fold, I am sure. EVER onward, mujer, one still, thankful and deep as it can be breath at a time. To courageous, positive, determined and beloved Susan, Sending you loads of Healing Energy to get you through this final phase. Rode my bike through Tiburon this morning and sent you a giant telepathic hug as I passed by, Sooz. Much love and thank you for writing this. 20 x 200 fly; 18 down, 2 to go. Negative split ’em Tiger! You can do this. We’re off to Ivy Champs on Tuesday to try to win you a big trophy. We started this season in your honor and we’ll continue to try to win it in your honor. You never quit a workout, don’t quit this! You got this and you’ve got an amazing husband and family to help you. And all the PUCSDT family is cheering you from all over the world. Hang in there, we love you! Ya vas a llegar a la meta Susana Eloisa! Ya veras que el próximo año nuevo sera una gran año nuevo, mucha fuerza desde Mexico.